Few aspects of your appearance can draw as much positive attention as a mouth full of brilliantly white teeth. Not only can a set of pearly whites enhance your overall appearance, they can also help to improve your self-esteem and confidence. However, maintaining a brilliantly white smile can have its challenges. A wide variety of foods and drinks can negatively affect the color of your teeth. While coffee and red wine lovers may already know the uphill battle they face, individuals who consume an abundance of such items as tomatoes, blueberries, cranberry juice, soda, beets, and soy sauce also have a higher risk of staining their teeth with what they eat. 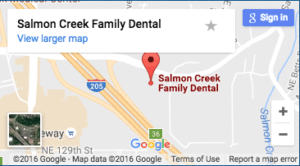 At Salmon Creek Family Dental, we want to help restore the brilliance to all of our patient’s smiles. As one the premiere dentists Vancouver, WA has, Dr. Nelson understands, however, that his patients have a number of options when it comes to regaining some of their teeth’s lost luster. The at-home whitening market contains an overwhelming number of options for consumers looking to improve their smiles. While at-home products can help to improve the color of your teeth, they do occasionally carry some risk, and not all products work as effectively as others. Here’s what you need to know when considering whether to whiten at home or to schedule a teeth whitening during your next appointment at Salmon Creek Family Dental. A number of different whitening products have hit the shelves in recent years that claim to improve the color of your teeth. Even though the majority of these products fulfill their claims, the time and discomfort required to use them may discourage some patients from attempting to improve the brightness of their smile at home. Whitening rinses. Used just like a mouthwash, rinses contain whitening agents that help to improve the color of your teeth. Whitening rinses have the benefit of being easy to use, as all you need do is swirl the rinse around in your mouth after you’ve brushed and floss. However, because the whitening agent comes into contact with your teeth for such a short period of time (most rinses only require you to swirl for 90 seconds), they work gradually, and can take several weeks to make a noticeable difference. Whitening toothpaste. Whitening toothpastes contain mild abrasives or enzymes that help to remove stains from your teeth through gentle brushing. Just as with rinses, whitening toothpaste can take several weeks to make a noticeable difference, and some people can develop sensitive teeth after prolonged use of whitening toothpaste. Gel strips. Generally applied to teeth once a day for anywhere from a few minutes to a couple of hours, gel strips need to be worn for 10 to 20 days, depending on strength, to lighten the color of your teeth. Whitening trays. Similar to the whitening treatment used by Dr. Nelson, trays filled with a bleaching solution fit over your teeth like a mouth guard. By far the most effective product on the mark, trays can help to whiten your teeth after just a few uses. However, unlike the custom trays made for patients by Dr. Nelson, over-the-counter trays are made one size fits all, and wearing them may cause gum irritation. At Salmon Creek Family Dental, our teeth whitening procedure is a safe and inexpensive way to improve the brightness of your smile. Depending on your preference, we can lighten just your upper teeth or both your upper and lower teeth. Once you let us know that you’re interest in whitening your teeth, we will begin to create a custom teeth whitening tray you can pickup at your next appointment. Unlike over-the-counter whitening trays, we provide you with a special bleaching agent you place in the trays that will remove stains from your teeth’s enamel with only one hour of wear a day. Once your teeth reach your preferred brightness, only occasional treatments are necessary to maintain your brilliant new smile. So when deciding on how to whiten your teeth, make sure to talk with Dr. Nelson to see what the best solution might be for you. ← Is an Electronic Toothbrush Right for You?